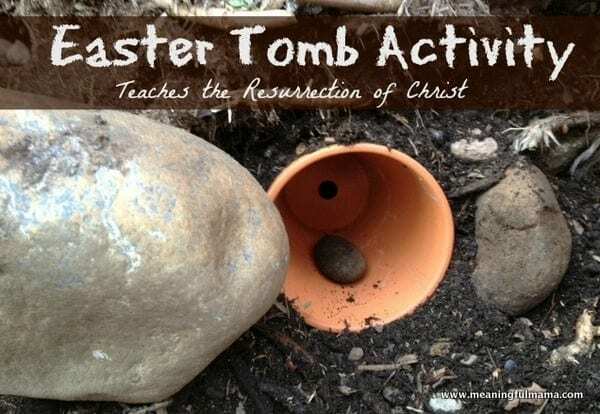 We went out to the yard today and did a little activity to teach the story of Jesus’ body being laid in the tomb. I came up with the idea of digging into the hillside, and I was wondering how I’d get it to stay a tomb and not cave in on itself. I found the idea to use a pot at Craft Interrupted. Her version is absolutely beautiful, but it was a little more involved than what I had time for this week. Maybe next year we will go all out with this concept, but I’m here to tell you that keeping it simple can be very effective as well. 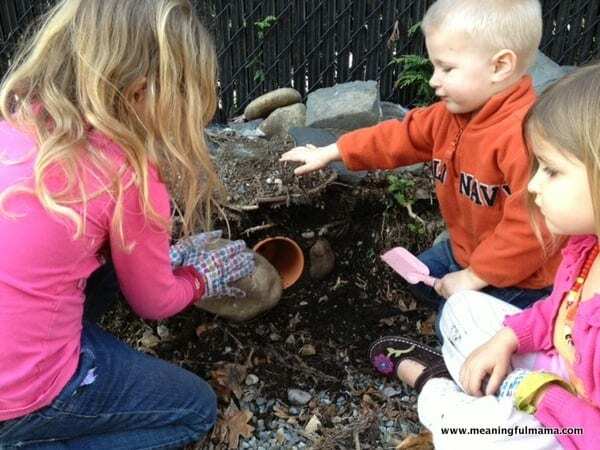 The first thing we did was to choose a place to dig out. We had a great little area set up perfectly. 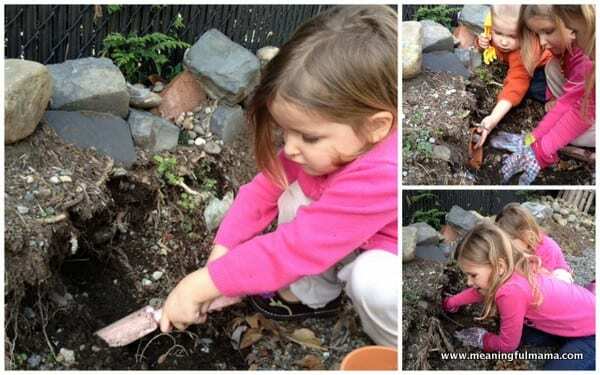 You can always dig a little, set your pot in and then bury everything but the opening. 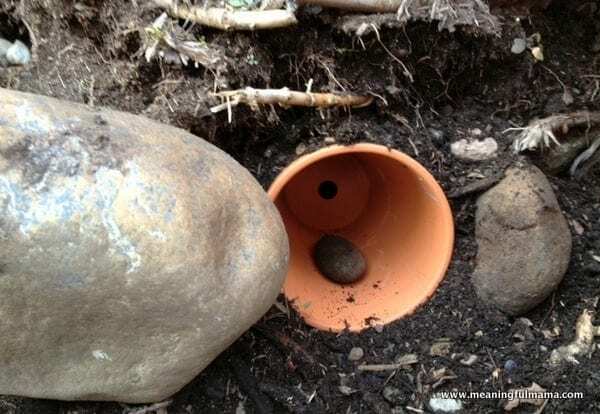 We dug into the hillside, stuck our pot back and then filled around with rocks, pine cones and dirt to make it secure. I told them that a tomb was a place people would place bodies after they died. I told them about burial clothes and how it was Jewish tradition to come and put perfumes, spices and oils on a body. We put a rock in the tomb to represent Jesus. I told them how Jesus was called the rock, and if we build our lives on him as our foundation we can stand firm. 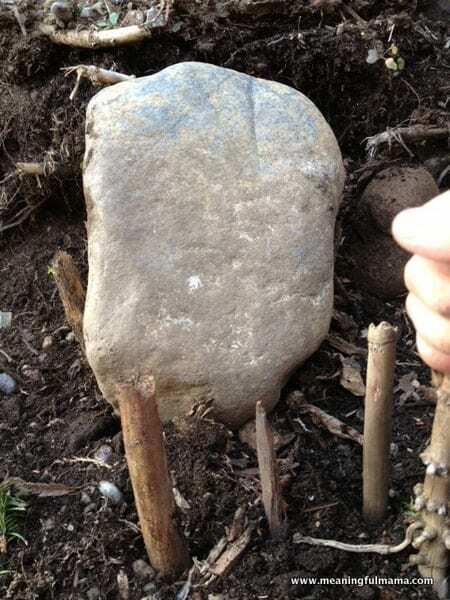 The next step was to set up the “guards.” We had sticks representing the guards. The Bible doesn’t say how many guards were at the tomb. Here’s an article about what a Roman guard traditionally consisted of, and it suggests there were 16 men. I read another article suggesting there were at least 4. The men would be severely punished if they failed at their duty. Listen, I have been a sceptic of Christianity. Faith hasn’t necessarily been easy for me. However, I have read many books on apologetics. In my own terms, apologetics studies the proof of God’s existence. While faith is always going to be a part of that, faith is a part of any belief you might have. It takes faith to believe there is no God. After compiling the evidence, I have come to the conclusion that there is a God and that the Christian Bible teaches who this God is and what He is all about. Pair my head knowledge with my heart knowledge in seeing how the Lord has worked in my life, and that becomes my faith. Part of that proof exists in the evidence for the resurrection. I am not going to write an article right now about all the of the proof of the resurrection. It’s been done, so I’ll lead you to a good link for this information. I encourage you to study it for yourself. On Easter, we will be rolling away the stone and finding the tomb empty. It will be a fun morning of celebrations. Although good Friday is a somber day, Sunday is coming! This is an awesome way to engage children with scripture! I love it, thank you for the post. Thanks so much. I’m always looking for ways to make it come alive to them. I really appreciate your comments.